Inventory We are a resale marketplace, not a box office or venue. Ticket prices may exceed face value. This site is not owned by Capitol Theater . 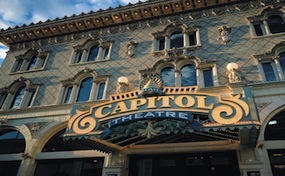 Capitol Theatre Salt Lake City is located in the heart of downtown at 50 West 200 Street. Capitol Theatre Box Office hosts many of the premier Broadway Across America shows. Opening in 1913 and renamed in 1927 this historic Utah landmark has been offering the best performances to all the citizens of Salt Lake City for almost 100 years. TheatreSaltLakeCity.com is in no way affiliated with any official box office or official website. We proudly offer secondary market tickets from the number one independently owned and operated site in the industry.